Jackie Dennis, New Zealand Society of Authors (NZSA) CEO says in her welcome note: ‘an idea has become a reality.’ The inaugural National Writers Forum, held on 17-18 September in Auckland, was the start of what will hopefully be a long-lived reality for the many aspiring, successful and established writers of Aotearoa. The two day programme was packed with 44 talented presenters including 16 from across the nation and five from overseas. Chris Cleave, award-winning British author, gave a thoughtful and thought-provoking keynote that set the stage for the next two days. It was a suggestion that hummed away at the back of many conversation as we took in panels on The Perfect Pitch; Structure, Plot and Pace; Copyright and Contracts; The Future of Publishing; and numerous masterclasses throughout the weekend. My highlights were Helen Lowe’s session on Building Fantastic Worlds (utterly worth getting myself out of bed on a Sunday morning) and Chris Cleave’s session on Writing Psychology. With parallel sessions it was extremely hard to choose any particular panel or masterclass over the other, and delegates collectively groaned and wished for Hermione’s time-turner so as to go back and make the most of all the unfettered knowledge and experience. The first day concluded with The Great Debate as Michele A’Court and Toby Manhire battled it out against Paula Morris and Leilani Tamu to determine whether New Zealand books deserve special treatment. The audience, interestingly, was split rather evenly at the beginning but despite the best efforts of A’Court and Manhire it was Morris and Tamu who managed to sway the crowd. They argued that our New Zealand books deserve to stand up tall and proud against their contemporaries “not lie flat on their backs” on the pity table where poetry, sport, gardening and fiction must all hold clammy hands. During the closing panel, ‘I wish I knew when I didn’t know’ there were some deeply moving and insightful comments that spring boarded from the topic, including Patricia Grace explaining that although she never considerPotiki to be a political novel, she was well aware of making a political choice in not having a glossary: “I didn’t want Maori to be treated like a foreign language in the only country where it is spoken”. As she explained, the reception of Potiki was a reaction that she was glad she didn’t expect at the time and it was her mixture of “confidence and naivety” that kept propelling her forward. Cleave also added to the musings of the table saying that in retrospect he wished he knew that it was “okay to be stuck” and that such a place is a good thing, “a sign that the writing is asking you to make a decision”. Similarly, Stephen Daisley reminded the audience that novels don’t always come in the early bloom of one’s career but sometimes much later – quite possibly after you’ve learnt to use semi-colons; and Siobhan Harvey and Malcolm Neil both were hugely supportive of more opportunities and infrastructure for mid-career writers, female writers and writers with families. The audience, which had a large number of fiction writers with only a smattering of non-fiction, brought together those that wielded the pen and tapped the keys from across the country – land masses which as Cleave also pointed out, we named rather unimaginatively North and South. Many delegates had multiple books to their name and it is both encouraging and inspiring to see the generosity with which knowledge was shared. 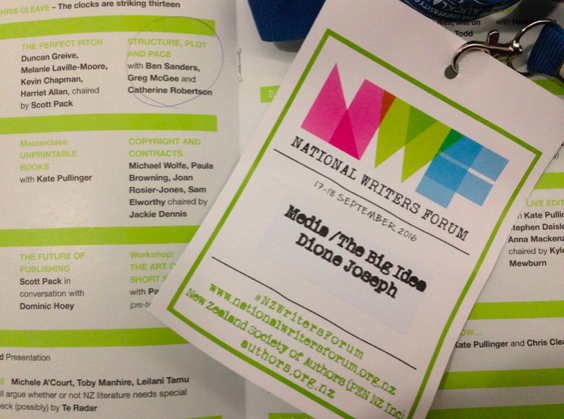 In future conferences I hope that a greater proportion of young and diverse writers can join this throng and contribute to an ongoing and robust discussion that serves the community that we know as writers from New Zealand Aotearoa.